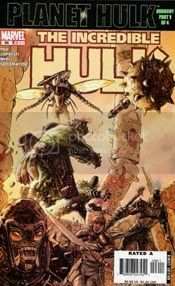 The first installment of "Planet Hulk: Anarchy" brings with it the opening shots of the military conflict between the Red King’s forces and those of Hulk and his warbound gladiators, a revelation about Miek’s past, and new penciler Aaron Lopresti. Right up front I’ve got to give props to Lopresti for maintaining a stylistic unity between his work and Pagulayan’s (who, unless I’m mistaken, will be returning for the third arc). There are visible differences, obviously. For example, the Hulk looks just a little less rugged than he did during "Exile." But for the most part Lopresti has given us a seamless transition, something I imagine could give a kick to the ego for someone working in any kind of visual medium. The supporting cast takes the starring role in "Anarchy, Part 1." Hulk, in fact, only has about a half-dozen lines of dialogue. Though his presence is still felt and we do get some cool Hulk-smashage. Miek, in particular, takes center stage as he leads the warbound gladiators to the land where he was born (hatched?). Hiroim takes on a more prominent role as the strategic adviser of the group, and the Brood Sister is becoming one of my favorite of Hulk’s allies. Pak makes her both surprisingly empathic and utterly creepy. I’m not going to get into the particulars of Miek’s story, because Pak handles it so well I feel like relating even the basic, non-spoiler facts could take away from a reader’s enjoyment. Suffice to say, Miek’s past leads to a conflict, and Pak fools you into thinking he’s going to give it your average "shiny happy people" Hollywood ending. Then he pulls the rug out from under you and shows why this chapter of "Planet Hulk" is called "Anarchy." Finally, kudos for the hilarious letters page that features the Red King answering reader questions, and also what may or may not have been another light-hearted jab at Hulk’s Ultimate counterpart (hint: It’s on the first page and it has to do with Hulk’s diet).